To follow along, download the macro and open it in Keyboard Maestro. Before you use it, though, make sure you read the Don’t use my code! section below, which explains how to replace my code with code that’s much easier to customize. The first step—the semaphore lock—is there to prevent more than one palette from being activated at the same time. It’s opposite, semaphore unlock, is the last step of the macro. The next two steps empty the variables that hold the HTML and characters, so the pop-up always appears blank. Step three sets the default return mode to HTML, because that’s what I use most often—change it to Chars to change the default, or set it to %Delete% to not have a default. Step five is the actual Custom HTML Prompt code, which I’ll cover shortly. 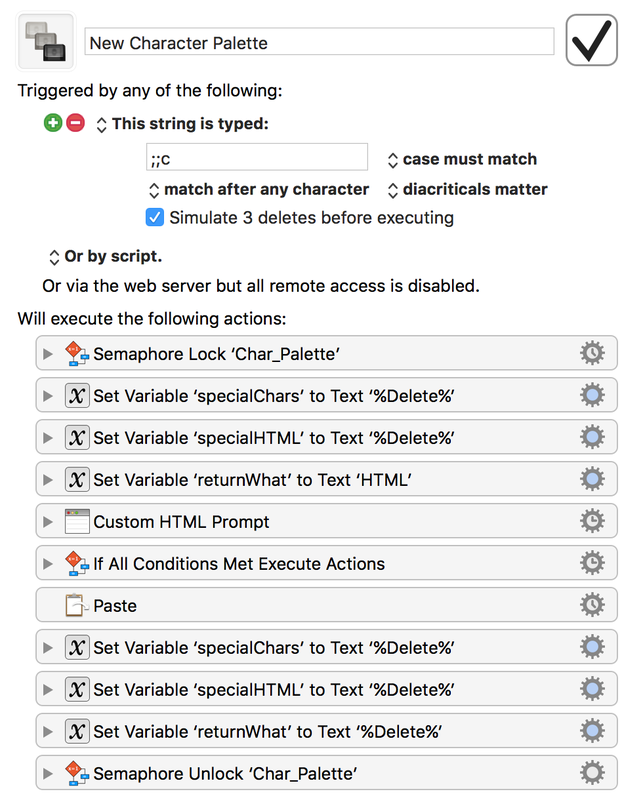 Step six is a conditional that loads the clipboard with either the HTML codes or the characters, depending on the chosen mode. After that, the clipboard is pasted, and the variables are cleared. I’ve been using this for a week or so, and it works really well. The first working version was particularly horrid, using tables for the button layout, which made updating the keys a major hassle. The second version, reproduced below and included with the downloaded macro, is better: Adding buttons no longer requires updating a table-based layout, but you still do have to tweak two sections of the code. Even though my code is reproduced below, and included in the downloaded macro, I recommend you do not use it. There’s nothing wrong with it functionally—it works perfectly well. But my friend James took a look at my script, and did a little bit of work on it to make it much better. And by “did a little bit of work on it,” I mean that he replaced 95% of my code. 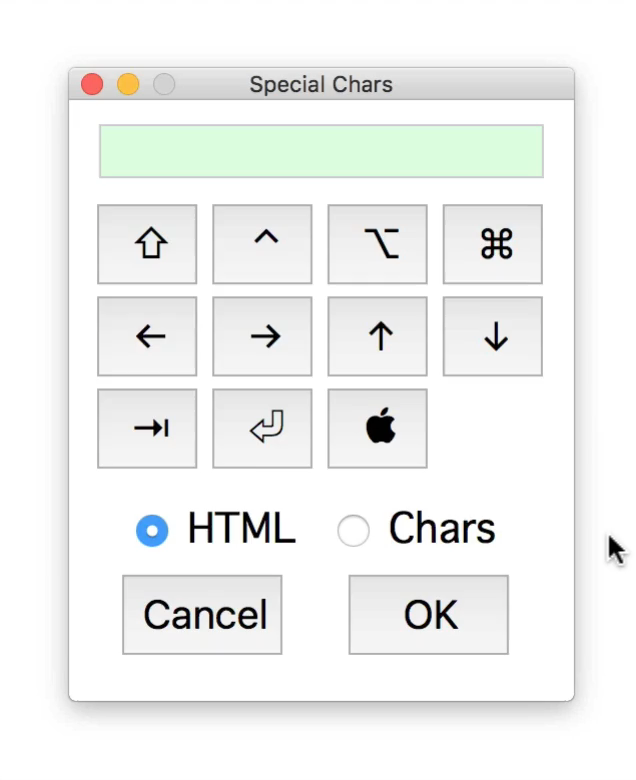 In order to handle both the HTML codes for the special characters and the special characters themselves, there are two input boxes on the form: The green visible box at the top, which displays the characters as you type, and an invisible box that holds the HTML code for each character. The remainder of the CSS is pretty basic stuff, just positioning the buttons and text. The first line prevents the default action of the form. I honestly have no idea what that action is, but I know that if I don’t do that, the form will beep every time you touch a key. The second line checks the value of the trapped keystroke, and as long as it’s defined in the array of my_keys, it proceeds to the document.getElement…. This step is the key to the code: document.getElementbyId() returns the element on the page identified by whatever’s within the parentheses. In this case, what’s in the parentheses is the value associated with the matching key code from the my_keys array. In the case of the “C” key as shown above, that’s “CmdKey.” Once this command retrieves this element, it sends it a mouse click (the .click() bit at the end). These two lines are what populate the character and HTML fields, the += is a shorthand way of saying “This field = This field’s existing contents + this new content,” which is how the string of characters grows each time you “press” a button. And that’s really all there is to the code. If you’d like to modify the palette, the first step is to make sure you’re using James’ much improved version. Seriously—modifying my code is feasible, but it’s a fair bit of work if you’re going to modify many of the buttons. The last number (320) is the height of the window in pixels. Experiment to find a value that works for you. The first number is the ASCII character code, where 65 is A. There are many sites that will display the codes as you type, if you don’t want to do the math; here’s one I’ve used. 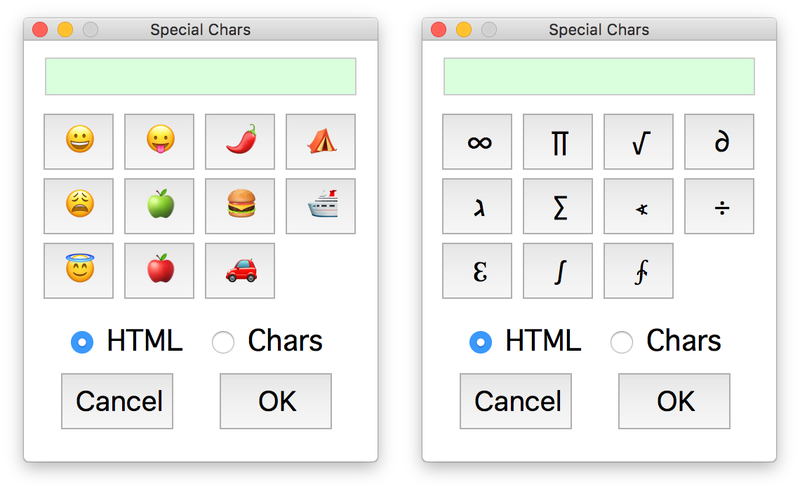 The next thing to modify is the symbol (⇧ in this example), and the third is the Unicode representation of that character (&#x21E7;). Finally, the last value is the shortcut key that you’ll use to insert the symbol into the output area. This character must match the ASCII value you entered earlier—in this example, the “S” key has an ASCII value of 83. To add more buttons, just copy and paste an existing row and edit as necessary. Buttons are added horizontally first, then vertically, based on the order they’re listed in the script. And that’s really all there is to it. Compared to editing my code, this is miles easier! So thanks, James, for the greatly-improved code! It’s working fine here—I wonder if you managed to load a version of the article that I edited, and Safari is showing the cached version. Can you empty the cache and reload? Does this link work for you? http://robservatory.com/dlfiles/james_code.js.zip. If so, things are *very* strange, because that’s the link that’s in the article. Can you hover over the download link and see if it matches what’s shown above? My bad! It was linked in two spots; the second one was wrong. I’ve fixed it now. Sorry for my late answer. As you already said it’s working now. Finally also thanks for this and the latest (great) posts. Giving up the ability to cancel the palette using the escape key is the only way to add “?” to the button list, right? Did you mean the actual question mark, as shown? Or did you mean the Escape key itself? If so, then right. Here’s the AppleScript I’ve been using. 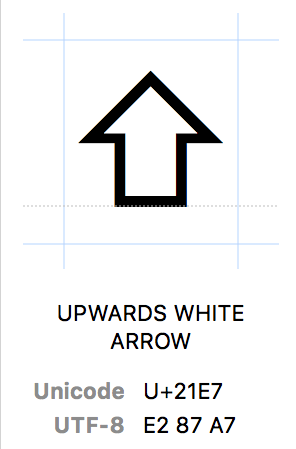 You can select one using down arrow, and more than one by adding shift if they’re consecutive. If not, you have to use the command key and the mouse or trackpad.